Help Your Child Succeed In Life. It’s Never Too Early To Start! 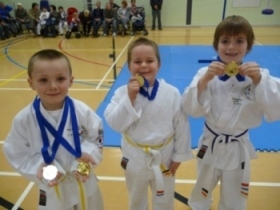 Children thrive on the challenge of martial arts training! By the age of 4, children are ready to experience an introduction to the teachings and benefits or Martial Arts. We are recognised by the Department of Education – Learning and Skills Council as a professional learning provider. Our Tiger Tots classes are specially designed to help younger children gain a solid grounding in the benefits of martial arts in a safe and responsible environment. We help our young students develop a passion for physical activity that should help keep them fit and active throughout their lifetime, as well as instilling a sense of order and discipline from a young age. At Family Martial Arts Centres, we will increase your child’s confidence and self esteem, increase their focus at school, teach them how to avoid peer pressure and how to defend themselves, how to handle bullies and to avoid stranger dangers, as well as giving them valuable life skills and much, much more. This training system is designed to improve motor skills while enhancing attention skills. The instruction teaches the basic fundamentals of self-defence in a positive environment that helps foster a positive attitude in the kids. All classes are taught using the most safe, fun and exciting instruction methods available for this age group. This programme works in conjunction with the Karate for Kids programme, thereby emphasising the same important monthly themes and value system. This is a great way for kids to get exercise and have fun! 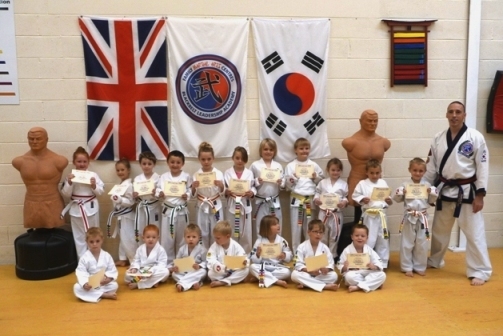 Badges are awarded for outstanding performance in the martial arts class, home and school. We believe in positive re-enforcement for appropriate good behaviour and performance. The Tigers Tots system is based on a lifetime learning concept in addition to technical skills. Our basic building blocks for the Tigers Tots system are monthly themes, including the following: Courtesy, Respect, Confidence, Honesty, Perseverance, Self-Discipline.